As you know, I love maps. 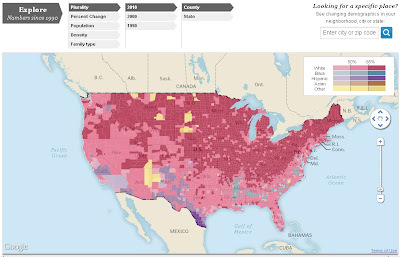 The Washington Post created an interactive map of the United States made with Census data from the last thirty years. You pick which theme you want mapped (population, density, family type, etc. ), which year, and which geographic level (state or county) and voila! It is a fun toy ...er, I mean, it is a great tool! I hope you enjoy it as much as I do! Click on the picture to go to the map's site. Found via @GeographicalMag on Twitter.